Kira Miller is a highly gifted engineer working in the field of gene therapy; she manages to enhance the function of the brain to such a degree that makes immortality a real possibility through a savant like consciousness. But what secrets could be unlocked by playing god with the human brain? 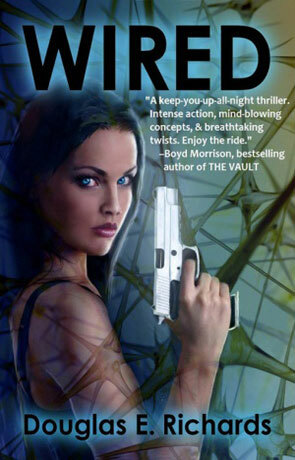 Wired is at its heart a high tech conspiracy thriller that makes effective use of the latest knowledge of biotechnology and creating intelligent arguments about just were this research could go. The characters are very well fleshed out, if a little clichéd and not really very original but non-the-less realistic enough to form a bond and written in delicious shades of grey. David Desh is the ex-special forces soldier who is brought in to track down Kira - the deadly attractive wunder genius who has been tagged as a mass-murderer and associate of terrorists. It's one of those books that keeps you guessing just who is the good guy and who the bad, perhaps they are all as good or bad as each other. The plot is pretty gripping and fast paced with plenty of twists and turns while there is a real maturity to the book, a confident voice that manages to project the story in a considered and intelligent manner. I loved the idea of using gene therapy to unlock the full potential of the old grey matter and for a layperson the execution seemed perfectly and quite unnervingly plausible. The story really does keep you glued to the pages and there is little let up from all the action and intrigue. The ending is also very well played out and much more satisfying than I imagined it would be. Wired is a fantastic futuristic and high tech game of cat and mouse - a well written thriller that will leave you at the very edge of your seat with your heart racing faster than Usain Bolt being chased by a bear, recommended. Written on 12th December 2011 by Ant.